Would You Like Spam With That Comment? Due to a little upswing in spam I turned on word verification for comments. Sorry for the inconvenience. Please keep commenting! Blog more fun w/ comments. As I mentioned before, I've been teaching an online intro to computers and library stuff course this summer. One thing I've been experimenting with is providing audio lectures for each week of class in WebCT. The lectures ran from between 3 and 15 minutes, depending on the topic for the week. I'm using a state wide podcast server hosted by the folks at GC&SU to host my files, which has been both good and bad. The uploading process is very simple, making it easy for anyone to provide media content to courses or use the server to host class projects. You can set up different "podcast channels" for different content areas. And each "channel" automatically has its own feed for syndication. So far so good, but there are a couple of downsides. First, the feeds only work through iTunes. You can't create all-purpose feeds through Feedburner or anything. GCSU is pretty deep in with Apple, but this really isn't acceptable. There are at least a few students out there (7 to be exact...I counted) in Georgia who have a non-iPod media player. So the portability of class content for these students is automatically limited. To get around this I tried to link the individual MP3 files to a Blogger blog and run the blog through Feedburner to make a multi-player feed for the class. No dice. For some reason the files hosted on the server refuse show up as enclosures even when linked elsewhere and Feedburned. I was able to host the exact same files on OurMedia and create a feed from that, but the upload and download times are often too slow to be useful. 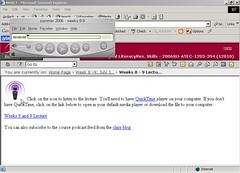 Fortunately, nobody took advantage of subscribing, they preferred to listen from WebCT. "One can often gain a different meaning from hearing something as opposed to just reading it, so I find the audio lessons help me feel I have a better grasp of the material and the assignments." So I'll definitely keep it up next semester and would definitely recommend providing some sort of audio/video lecture content if you're teaching online! Very cool new videocast at Westerville (OH) Public Library from Library Stuff via David Lee King. Hopefully they'll put the "cast" in castr soon enough. It's great to see all of the awesome stuff that's developing in the pod/vidcasting world these days. Really like their website design too! 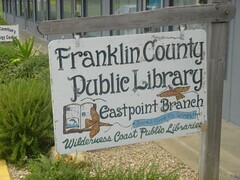 I was in Florida last week for a friend's wedding and took advantage of the services of the Franklin County Public Library Eastpoint branch to check in on my online class. They provide public Internet access to anyone, regardless of residency, which came in very handy. No forms or anything to fill out, just sign in with your first name and you're ready to go. The branch is located in a shopping center just before the bridge to St. George's Island so I'm sure they get a lot of business. It had a very cool used book store feel with lots of shelves of books crammed into the relatively small space. 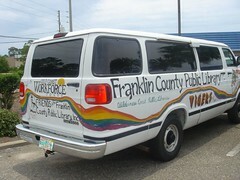 They also have this cool van which I think serves as their bookmobile. Or at least promotes library programs. A friend of mine saw it at Piggly Wiggly! Another great beach library is the Tybee Island Library on Tybee Island, GA. They provide temporary borrowing cards to visitors and even have fishing poles and tackle available to check out! Any other favorites out there?